A special shout out to John (Terredax) for his unselfish and generous act in assisting me with the design and refinement with my new look "logo". John make quick work of my original design and refined it using his knowledge and expertise in giving me something that I can truly say I'm proud of. In the next few days as my time allows I will be posting the new logo on some leatherwork that I have in mind. John claims that his effort was nothing special but I think otherwise. To a true pro (John), the work was straight forward and easy. For someone such as myself, it would have taken much time and energy with possibly having to learn file conversions. John saved me the hassle and kindly assisted with the design. It's these types of generous acts that makes IAP such a great place to be associated with. Once again John, a great big thank you. I hope to pass the kindness to help to someone here and in life. These are a few items which I have used the new logo on. 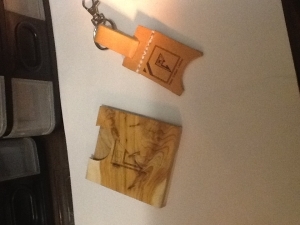 A leather keychain ring and a mini business card holder made from juniper. I'm definitely not a pro, and I didn't do anything special. Peter did all of the work, and all I did was to clean it up so he was able to use it. I don't have much to contribute, but when I'm able to lend a helping hand, I will do my best. I was more than happy to help with the request, and if Peter is happy, that's all the better. From reviewing the photos, it seems that the image works nicely, and on some nice items. You are too humble John. You saved me a bunch of time and effort. Thanks again.